I obviously love soup, so here’s yet another. I will apologize now that most of the posts for the next couple months will be more on the healthy side, not that that means they’re not exciting and tasty – would I blog about anything else? Come summer though, there will be plenty of artery clogging, fatty goodness to wrap your taste buds around, so hang in there. In the mean times of January and February though, we stick to cheaper, lighter meals which are satisfying and that we don’t have to feel to guilty about – mostly because on the weekends we tend to eat our weight in ‘bad’ food having dieted all week (a good balance, I think). This is one such Friday night dinner which we will eat convincing ourselves that it is offsetting any damage that might be done at the ale festival we will be attending from 10:30am tomorrow morning. I owe this recipe to a fellow food blogger, check out the original post and recipe here. 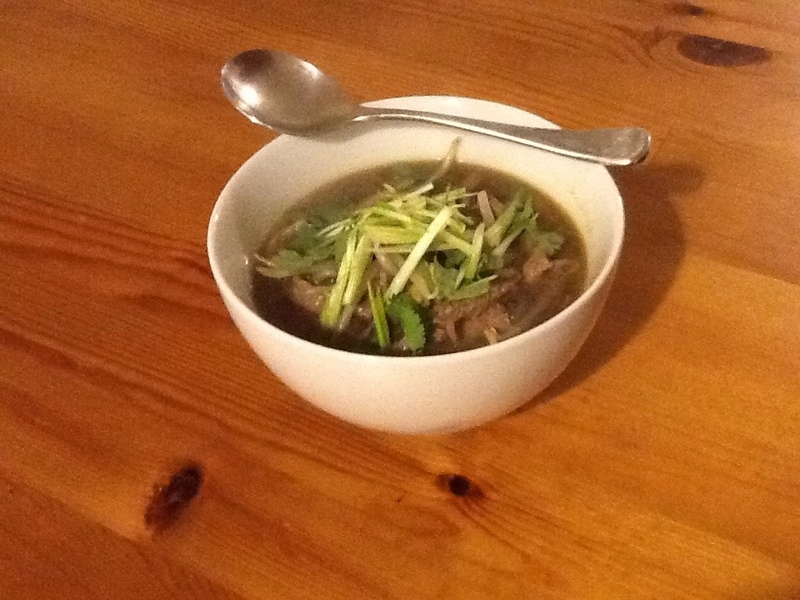 Interestingly, the word ‘pho’ may have either been derived from the French pot au feu (which I’ve never made) or the Vietnamese pronunciation of rice noodles (which I didn’t use), so pretty irrelevant to this blog. Either way, this is a quick version of the Northern Vietnamese staple where you don’t have to spend hours boiling bones to make the stock. Phew! This particular recipe is a good base. Having made it, I would probably add more ginger than suggested to make the freshness really stand out. At the point where you brown the onion, garlic and ginger in the pan I also added a whole green chili and browned it on all sides. 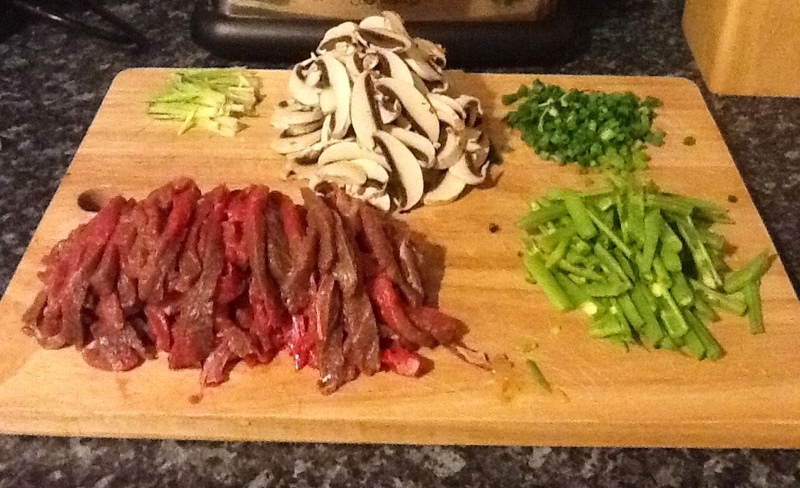 Then I pulsed all of this together in a food processor and then added the paste back to the pan with the stock. I took the cinnamon stick, which was a monster, out early as it was starting to take over the flavor of the stock. Unfortunately, due to my local supermarket being…limited…in ingredients from ‘around the world’, I couldn’t get any star anise so I substituted a teaspoon of Chinese five spice which I added into the food processor with the onion, garlic, etc. What I really like about pho is the freshness; you barely cook the vegetables or the meat. The mushrooms and sliced green beans (another addition) cook for mere minutes and the beef and beansprouts literally have 20 seconds in the broth. This, plus the basil, cilantro and mint gives everything a lively, jubilant flavor that just dances around your mouth. The combination of the hot, savory broth, the fresh, crunchy veg and herbs and the spicy sriracha (or chilli pesto in my case because, you guessed it, my supermarket is crap) is incredible. It’s so simple, in fact amazingly so, and yet it delivers on so many levels. 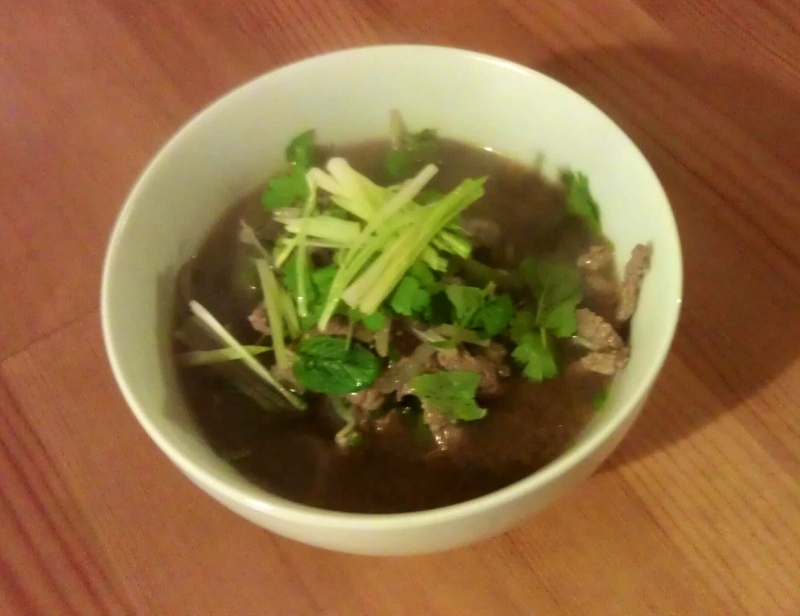 This recipe didn’t quite have the flavor hit I was hoping, but it was still delicious and satisfying and with a few tweaks it could be a great version of pho that doesn’t take ten years to make. I’ve eaten pho in Vietnamese restaurants on a couple occasions, none of which were overly exciting, but it hadn’t actually crossed my mind in years. Seeing the Sicilian’s blog post awoke the love I have for foods which are both fresh and comforting. I find it is sometimes difficult in winter to get the comfort we all crave from our food while not going overboard on cheese, or cream, or butter, or carbohydrates, or all of them simultaneously. But Asian food has the answer to all of this – I know modern European and American chefs are doing amazing things with vegetables and winter salads, etc, but, as I’ve probably drilled into you by now, it’s not always easy to get good quality local produce where I live and the selection of fruits and vegetables can sometimes be uninspiring. However, things like ginger, chilies, cilantro; these are things I can get all year around and they always deliver. 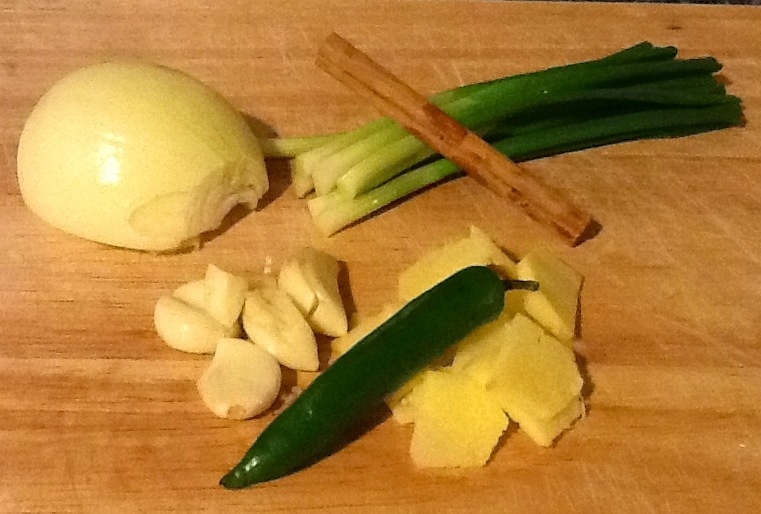 Thanks to The Sicilian for the inspiration and recipe to quell my pho pho-bia. Very nice! Now I gotta make it. Still think u should’ve used Jaegermeister as a sub for the star anise. Didn’t see that suggestion until after! Oh well, next time. Glad you enjoyed it and made some interesting additions of your own!